Very stylish. 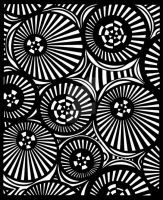 It looks kind like the pattern on a shirt I saw at Venice Beach. Wow! Everything fits together so beautifully! I wish I could make these kind of intricate designs.